I was intrigued, not long ago, to see a tweet by Dr. Prabhakar Raghavan that went “Berkeley Study: Half-Star Change In Yelp Rating Can Make Or Break A Restaurant http://tcrn.ch/RAy1iM nonlinear outcomes from linear(?) inputs“. Anderson and Magruder at Berkeley observed Yelp ratings and tried to see if they impacted the likelihood of a restaurant being fully booked at peak dinner time (between the hours of 6 and 8 pm). So, the answer to the first question seems to be “A lot farther than you’d think” or “About as far as 4 is from 1” ! Now I am going to show you something else that is equally amazing! 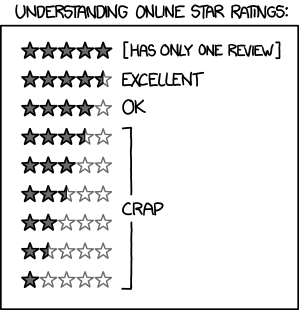 The above economics result is very similar to what is being talked about in this XKCD cartoon on online star ratings! Take a close look at the cartoon and you will see that the cartoonist is saying much the same thing as the economics researchers. How did the artist hit it right on the head? Just how did he do it? (maybe the cartoonist read the research paper – the guy’s a scientist so it could have happened). But could it just be that good artists are also incredibly perceptive and intelligent people? Does art take you from 4 to 5? I don’t have the answer to that, but I am going to point you to an intriguing paragraph in the book “Transforming Education through the Arts”. (From Page 7 of “Transforming Education through the Arts” in the article “The social and educational costs of neglecting the arts”, citing as the source: “Root-Bernstein and Root-Bernstein 2010: 4”). So, maybe the answer to the second question is ‘maybe‘. I say ‘maybe’ because there is another explanation. 80 percent of the features take 20 percent of the time. The last 20% of the features take 80% of the time. However, this 80/20 rule seems to apply to many things in life. You can be a better singer than 80% of the world quite easily. It might even be possible to become a better singer than 97% of the world with a bit more work. But it takes infinitely more effort to get from 97% to 99%. To reach those levels of perfection takes enormous dedication and persistence. This is the case in every art, and in every craft, and in every area of science, and in every area of technology. Products become magical when you put in that enormous effort that takes it from 97% to 99% of perfection. Dancers become magical when they go from 97% to 99%. We all heard the story of Steve Jobs obsessing over the details of the iPhone even during sessions of chemotherapy. Maybe that’s what makes all the difference in any area of human endeavour – the intense effort and drive that only very obsessed people are capable of putting in is the magic (or madness) that takes something from 4 to 5. Maybe that’s why 5 is so far from 4.